Buying bulk ammo is that much better when the cartridges come with their own ammo can! 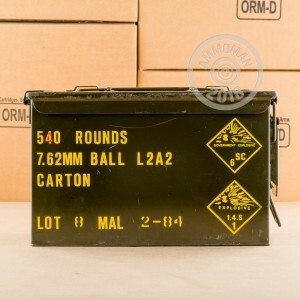 This 540-round box of 7.62 NATO ammunition was manufactured during the 80s and kept preserved within military-grade .50 caliber storage cans. Each steel can has a secure latch, foldable carry handle, and rubber seal which works as a protective gasket against humidity and moisture. These factors combined with the component choice of the ammo itself ensures dependably functioning rounds that will feed well in your FAL, SCAR-17s, or PTR 91. The 7.62x51mm ammunition in this package was made within close specifications to M80 ball, and therefore uses a 146-grain FMJ projectile with a jacket made from gilding metal and a sleek ogive. The bullet is loaded into a brass casing that has been annealed at its neck and mouth in order to provide proper pressure and chamber seal when firing; this contributes to more consistent muzzle velocities for plinking, zeroing, and amateur match use. At the base of the brass case is a non-corrosive Berdan primer that has been tri-stake in place in order to avoid show-stopping malfunctions. The primer was installed with an accompaniment of sealant to guard the inside of the cartridge against moist environments so that it remains shootable for years to come. I had issues the first time i tried using this in my brand new semi automatic ar-10 like firearm. It did not want to cycle properly and would function as a single shot, but cycled with 308 rounds, making me think it was the ammo. Once the firearm was lubed and retested with this ammo, there was not a single issue in a string of 50 shots. Highly recommend this ammo. This ammo did not cycle a single round in the 25 different attempts I tried to make it work. It just does not want to pick up the next round. I believe that the ammo is slightly underpowered and thus does not push the bolt back far enough for the next round to be picked up in the magazine. Great ammo. Works every time and came packaged in excellent ammo can. Super fast shipping. Will buy again for sure! Breaking in M&P10 16" carbine. Rifle functioned better with this ammo than .308. Ammo was clean, no duds, good accuracy, free ammo can. For the sale price pretty good deal. Ammo arrived quickly and have gone through 100 rounds without issue. Will definitely purchase more. About 1 in every 15 rounds got stuck in the chamber of my DSA FAL and caused a malfunction. Decent accuracy, seems clean. Had just purchased a new M1A Scout rifle so needed to ammo up. Gave these surplus rounds a go; they are excellent! My boys and I have put a a few through the rifle: all have fed, went bang and hit where we are aiming. When I get an optic on this rifle I can really test them but so far I am very happy. Going to save up some more money to get another can. Great price. Arrived at my door in two days. Can't wait to hit the range. It's not the first time I've bought ammo from you guys. And it certainly isn't the last. Keep up the outstanding work! 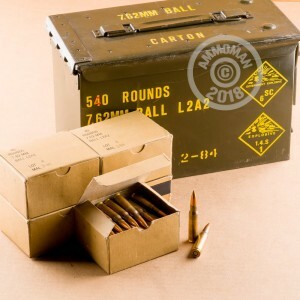 Well packaged ammo, quick and speedy delivery along with great price. The ammo shoots great through my AR10. I will buy another 1000 rounds when I finish off these babies. Thanks for carrying this type of ammunition Ammo Man! Great ammo and great deals. Ammoman, you are the Man.